Six River Marine is pleased to introduce our new Harbor Island Series. 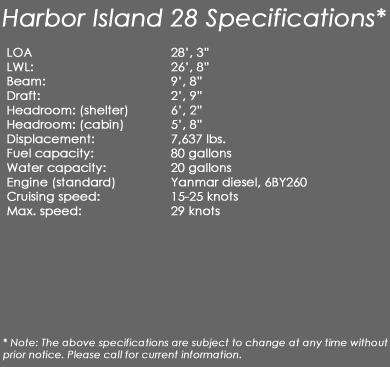 The Harbor Island 35 (shown below) is the first design of the series, and we also have a 28' version available. Inspired by the elegant Downeast lines of Maine's working lobsterboats, the Harbor Island series of boats impresses with their classic style, rugged construction and seakindly motion. 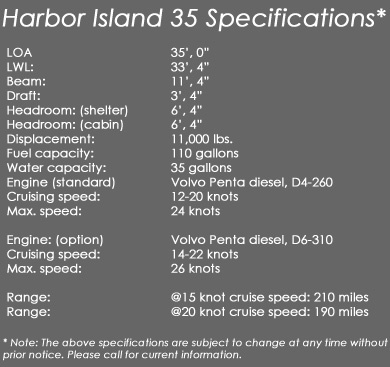 You can learn a bit more about the Harbor Island series of boats below but please feel free to contact us anytime for additional information or to discuss any questions you may have. 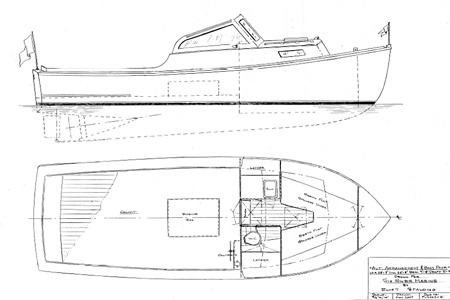 The Designer: The design comes from the drafting table of Naval Architect, Eliot "Al" Spalding. Mr. Spalding's design experience includes 15 years with John G. Alden, where he achieved the position of Chief Designer, and as a principal partner in the design firms of Andel Associates, Marbridge Associates and Lowell and Spalding. His proven designs have resulted in sail and power vessels ranging from 8 to 95 feet. The Boat: Designed and custom built for discerning yachtsmen, the Harbor Island 35 will transport her owners in style, comfort and safety. With simple yet elegant accommodations below and ample room on deck for entertaining, the Harbor Island 35 is the perfect boat for a day of island hopping or taking a cruise along the coast. This is a yacht to truly enjoy time on the water with family and friends. She is a comfortable and seaworthy yacht that will efficiently cruise ( with her standard 4 cylinder 260 hp Volvo) at 15 knots while only burning 7gph. Or cruise all day long at 20 knots for those with a destination in mind. Construction: Here at Six River Marine, we build the Harbor Island boats in the finest Maine tradition, using the cold-molded, wood/epoxy method. This technique allows us to create a yacht with the beauty and feel of wood with the added benefits of a strong, lightweight hull requiring minimal maintenance. Click on the above images for larger versions. The top image shows the Harbor Island 35 elevation drawing, the second is the arrangement plan, and the third down shows a bass boat configuration. Click on the above images for larger versions. 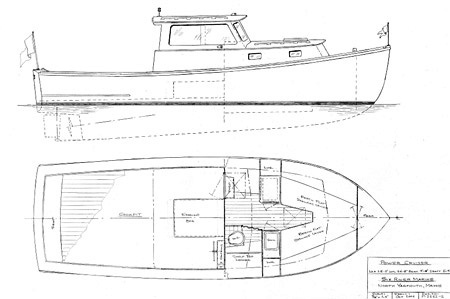 The top image shows the Harbor Island 28 profile and arrangements plan, and the second is a profile drawing and interior of the bass boat configuration..